Add Premium Reduced Representation Bisulfite Sequencing (RRBS) Kit to my shopping cart. Reduced Representation Bisulfite Sequencing provides a powerful method to efficiently analyze DNA methylation at the single nucleotide level without the higher costs associated with whole genome bisulfite sequencing. By cutting the genome using the restriction MspI enzyme (CCGG target sites) followed by size selection, DNA is enriched to represent CpG-rich regions (including CpG islands), in which DNA methylation marks are typically found. Thus, RRBS provides a cost-effective method for analyzing DNA methylation by reducing the part of the genome that actually needs to be sequenced and focusing on relevant CpG islands. Comparison of CpG coverage between competing technologies. 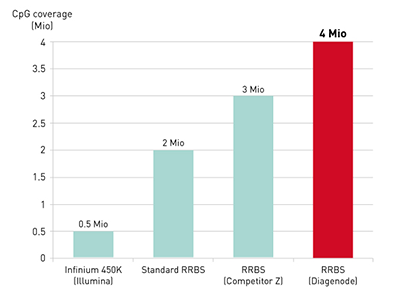 The new Diagenode Premium RRBS Kit makes it easy to use RRBS cost-effectively and with high throughput, using early sample pooling and multiplex sequencing. Most importantly, the method provides an improved coverage of up to 4 million CpGs for the human genome. We successfully used this protocol on more than 1,000 samples comprising of six different species, various cancers, FFPE and lowinput samples. Excellent results were obtained using Diagenode’s Premium RRBS kit: almost 90% alignment rate, 4.1 million CpGs covered and bisulfite conversion rates around 99.5% for all samples. DNA methylation percentages in the region of IGF2 obtained with the Diagenode’s Premium RRBS Kit. Two human cell lines were analyzed: Gm12878 and MCF7. The MCF7 cell line was studied in duplicates. Each peak represents the DNA methylation percentage at one CpG. The methylated CpGs are shown in red and the unmethylated CpGs in grey. By cutting the genome using the restriction enzyme MspI (CCGG target sites) followed by size selection, DNA is enriched to represent CpG-rich genomic regions (including CpG islands, CpG island shores, enhancers, and other gene-regulatory elements), which are particularly relevant for epigenetic regulation. 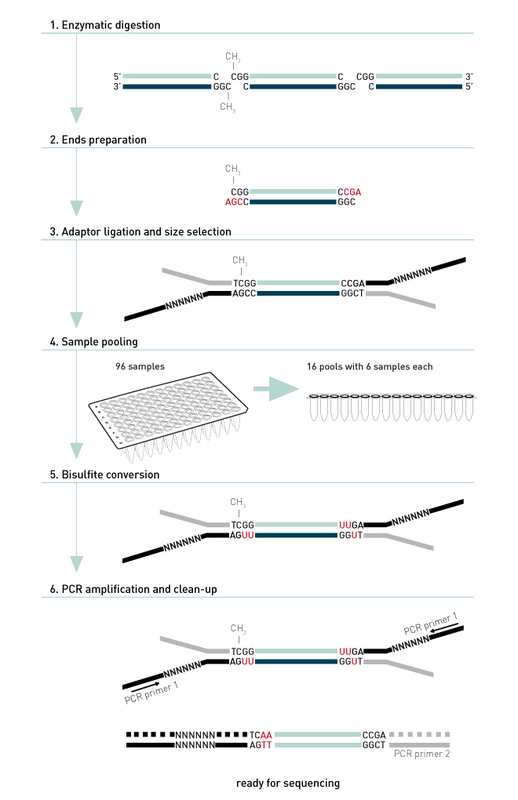 Similar to exome-sequencing for mutation discovery, the RRBS protocol enriches for some of the most interesting target regions and thereby achieves a reduction in sequencing cost of a factor of 10-20 compared to whole genome bisulfite sequencing. Our laboratory has used RRBS sevice of Diagenode on murine and human samples. The service was impeccable in each phase, from the sample preparation to bionformatic analysis because it was always customer-oriented. I highly recommend my colleagues to use the RRBS service from Diagenode. Prof. Lucia Altucci, MD, PhD, Seconda Università degli Studi di Napoli, Dipartimento di Biochimica, Biofisica e Patologia generale . Using the Premium RRBS kit we quickly established the RRBS library preparation in our group. Diagenode's support on wet-lab matters as well as on bioinformatics was exceptionally customer-oriented and close, accelerating the establishment of the method. Our lab has used Diagenode’s Premium RRBS kit on rat brain samples. The protocol is understandable, logical, well-written and is easy to follow. It is a complicated, but ingenious kit. I found it fantastic that I could ask questions from the company, and their answers were really useful. We were able to construct a library, which we ran on BioAnalyzer, and the results looked very nice and ready to be sequenced. I would definitely recommend my colleagues to use the Premium RRBS kit from Diagenode. Diagenode strongly recommends using this:	Premium Reduced Representation Bisulfite Sequencing (RRBS) Kit (Diagenode Cat# C02030033). Click here to copy to clipboard. Differential DNA methylation of potassium channel KCa3.1 and immune signalling pathways is associated with infant immune responses following BCG vaccination. Zhang H. and Gelernter J. Add Auto MethylCap kit to my shopping cart. Add MagMeDIP qPCR Kit to my shopping cart. Add MethylCap kit to my shopping cart. Add Auto hMeDIP kit x16 (monoclonal rat antibody) to my shopping cart. Add hMeDIP kit x16 (monoclonal rat antibody) to my shopping cart. Add Premium Bisulfite kit to my shopping cart. Add Auto Premium Bisulfite kit to my shopping cart.